Dale (Brad Heberlee) has questions for Gloria (Stephanie Wright Thompson ) in The Mad Ones’ production of Mrs. Murray’s Menagerie. 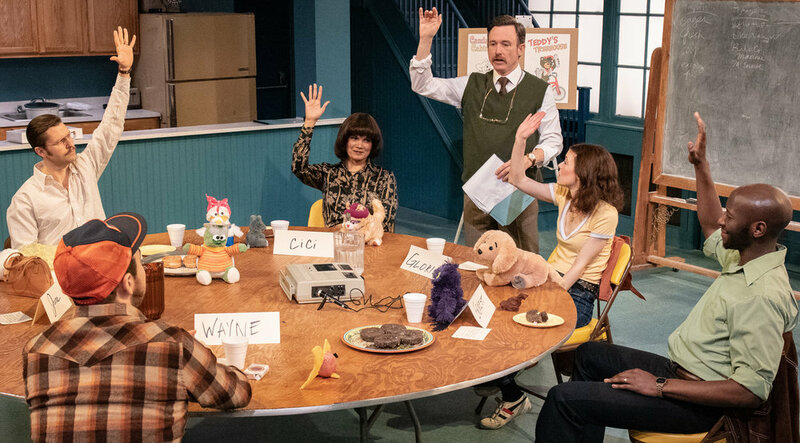 Top: Dale leads a focus group of parents discussing puppets. Clockwise, from left: Joe Curnutte, January LaVoy, Heberlee, Stephanie Wright Thompson, Phillip James Brannon and Michael Dalto. The Mad Ones are a dynamic group of artists who create plays about group dynamics. Their 2016 success, Miles for Mary, hilariously pitted six high school teachers against one another as they attempted to plan a fund-raising telethon. The grownups in Mrs. Murray’s Menagerie are also concerned about schooling, but this time they are mothers and fathers participating in a focus group, circa 1979. They are being paid to relate their feelings about one of their kids’ favorite educational TV shows, while judging the merits of a couple potential spin-off series. Along the way, they discuss a panoply of parental pitfalls, including the problem of how crying children always seem to get what they want, and the relationship between fear and being misunderstood. Playing polite at first, these adults, in earnest conversation about puppets, slowly drop the niceties, revealing their own childishness. Insecurities, prejudices and sexism all come to the fore. 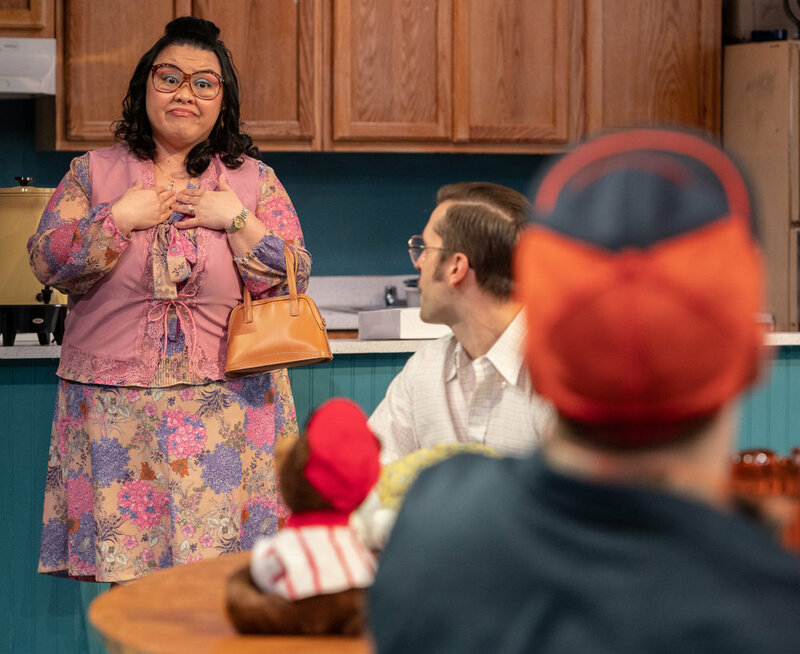 Under the always clever direction of the ensemble’s longtime collaborator, Lila Neugebauer (whose work extends to The Waverly Gallery on Broadway and more than a half dozen Off-Broadway beauties like The Wayside Motor Inn at the Signature and Kill Floor at Lincoln Center), there are no drastic actions or unforeseen twists. Instead, the actors act out with tiny jabs of condescension, passive-aggressive interruptions and knowing glances that build the kind of tension capable of exploding into laughter or, in one instance, when a man dismissively touches a woman’s shoulder as he passes, erupting into disgusted gasps. Handwriting analysis rarely comes into play at the theater, but here nearly everything one needs to know about these characters is foretold in the way they have signed the name cards they have placed in front of themselves around a large, circular table. Roger (Joe Curnutte), a salesman, writes in egotistical, overly compensational all-caps. June (Carmen M. Herlihy), whose name appears in flawless cursive, is sensible to a fault. A puppet mouse, to her, is not so much adorable as it is a vermin problem. Cici (January LaVoy) has pressed down in thick, bold letters, befitting her power-mom persona. When asked how she is most like the Mrs. Murray TV character, she earnestly responds, “I try to lead with love.” The capital E from the mostly laid-back Ernest (Phillip James Brannon) is scribed with a carefree loop, but Gloria (Stephanie Wright Thompson) has signed in the kind of frantic scrawl that suggests she is barely holding things together. In contrast, Wayne (Michael Dalto), has angled the stems and crossbars in the letters of his name with ease, like the tool-and-die worker he is. Tension mounts between June (Carmen M. Herlihy), Roger (Curnutte) and Wayne (Dalto, foreground). Photographs by Ben Arons Photography. The focus group is led by Dale (Brad Heberlee) and his assistant, Jim (Marc Bovino). Heberlee perfectly captures the rapid-fire yet totally non-threatening way of interrogating his volunteers that is unique to this specific career choice. In terms of both tempo and temperament, he provides the critical spine of the production. Bovino, by contrast, is classically comedic. Mostly silent throughout and with an unexplained broken arm in a cast, Jim is tasked with tracking the group’s numerous reactions on a chalkboard. His ability to do this in a one-armed frenzy is funny enough, but he transcends into hilarity whenever Dale chastises his penmanship. They are Laurel and Hardy yucks that ricochet nicely through the show’s otherwise more complicated humor. By the time the evening has reached its end, the parents realize just how much they have revealed about themselves, and are not especially happy with the way Dale and Jim have gotten them to this point. When Dale asks the group to fill out evaluation forms to “let us know how you think we’re doing and how we might conduct these focus groups better,” their reactions to the request reflect a universal truth about both children and adults: some will always do as they are told just as surely as others will always rebel. Mrs. Murray’s Menagerie runs through April 27 at Ars Nova at Greenwich House (27 Barrow St.). Evening performances are at 7 p.m. Monday to Wednesday, 8 p.m. Thursday to Saturday, and at 8 p.m. April 23 and 24; matinees are at 3 p.m. Saturdays. For information and tickets, call (866) 811-4111 or visit arsnovanyc.com.